This deer was about to cross King Street today when yours truly came along. Wouldn't you know it, as I raised my camera, a $#@! car approached from the other direction. I managed to get only this one blurry shot before the animal bolted. 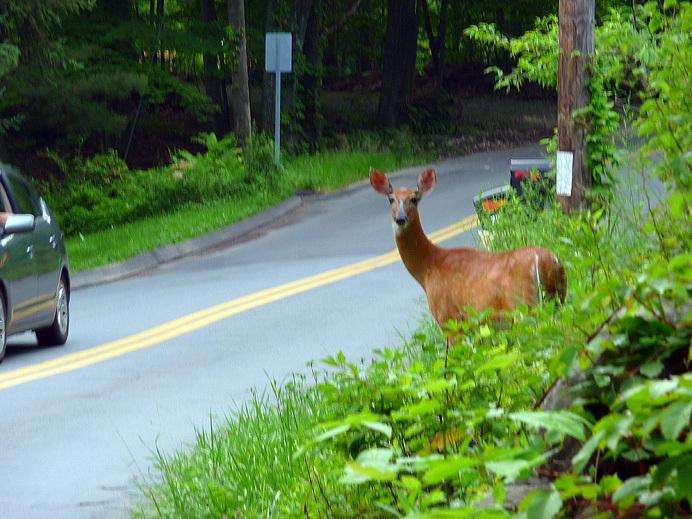 It stopped a few yards to the right of this picture, where it peered at me from someone's driveway. When I reached that spot, I raised my camera again—and another $#@! car came along. Again, I got only one shot before it snorted (the deer, not the car) and high-tailed it into the woods. Seeing deer makes me grouchy. To understand why, read Friday, June 19. (The deer I photographed that day was this same one. I confirmed it by blowing up both pictures and comparing the markings on the ears.) .